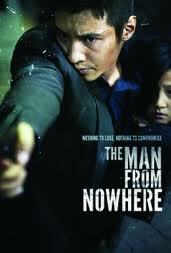 Director Jeong-beom Lee took a huge bite out of Korean box office with his high octane action thriller The Man From Nowhere, but what about his earlier works? As it turns out he's made only one feature film prior to this, and his debut movie is called Cruel Winter Blues (Yeolhyeol-nama). Also a movie revolving around gangsters, but more tame and personal than his new blockbuster. Seasoned, but still small time, gangster Jae-Mun (Kyung-gu Sol) takes gang's newcomer Chi-Guk (Han-seon Jo) under his authority and leaves for a small provincial town. There, soon set to arrive, attending his hometown's sporting event is influential businessman Dae-Sik (Je-mun Yun) who few years ago murdered Jae-Mun's friend. Unable to shake the guilt of his friends death, Jae-Mun in his own way is finally ready to settle this old matter once and for all. While waiting, he befriends mother (played by Mun-hee Na) of Dae-Sik who is owner and sole worker of a small dining place. As she starts treating him like her own son, Jae-Mun who is abusive and disrespectful to his underling, captured by her influence slowly starts to enjoy quiet and leisure life that this, imperfect in it's own way, dusty and crumbling town provides. His will to vengeance slowly starts to fade away. Change is happening somewhere deep inside of him. If you are expecting a gangster movie involving lot's of gunfire, fights, or other violent means of mutual destruction, this film is not for you. As opposite to The Man From Nowhere, which had plenty of aforementioned stuff, this is much slower paced, personal drama. But still it's a gangster drama, obviously a popular sub-genre to explore in Korean movie circles, so there will be blood. First class performances by all of main cast, great direction and cinematography. A great take on genre by Jeong-beom Lee. Engaging, heavy and personal story. Definitely worth a watch.